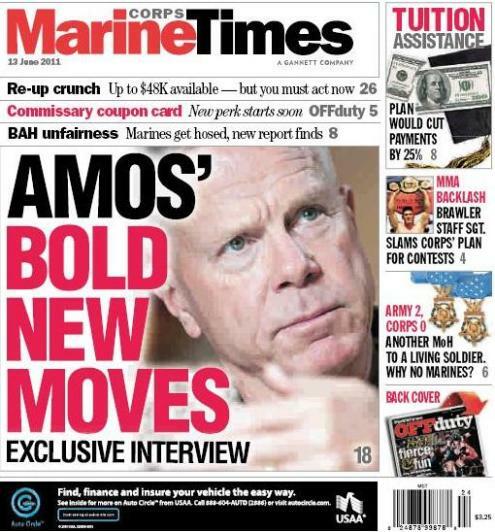 This week’s Marine Corps Times should immediately catch the eye of many readers. The cover story features an exclusive, sit-down interview with Commandant Gen. Jim Amos at the Pentagon. Colleague Gina Cavallaro met with the general for the story before flying to Afghanistan last week, where she’ll be embedding with Marine units until mid-July. Amos shares his vision for the future Corps in several regards, weighing in on issues that will affect operational forces, military careers and Marines planning to jump back into civilian life. Look for it on newsstands this week or subscribe here to read it online.